Provides student and teacher access to Accelerated Reader, and STAR Testing. Wondering if a book title is in the Accelerated Reader List? Check through this website. Look up any passage from the Bible. Choose from a large variety of translations. This website provides students and teachers access to Atomic Learning, Book Flix, Britannica Online, iClipArt, TrueFlix and many other resources available to our students through NorthWest Area Education Agency. FreedomFlix™ is an online resource that converts the Cornerstones of Freedom series into enhanced eBooks. All the eBooks include related content and primary sources featuring videos, audio, images, and text. All books include an optional natural-voice read-along of all text, sidebars and captions. Educator resources include lesson plans, writing prompts and whiteboard activities. Science Flix is a resource for teachers and students. 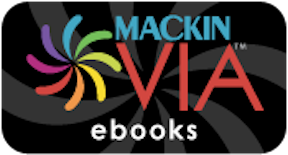 Mackin Via is an online portal that makes it easy to access eBooks. Mackin Via provides users four ways to search for content: keyword search, viewing pre-selected categories, advanced search using the available filters, and browsing the collection. Mackin Via also permits students to save the e-resources they like using the Via Backpack. MackinVia eBooks can also be read on tablets, mobile devices and Smart phones by downloading the free app. Teachers and Students can use Photos For Class to access safe images that are available for all classroom purposes. Downloaded imaages automatically cite the author and image license term. All photos shown are licensed by Creative Commons. Access the catalog and see upcoming events for the Orange City Public Library. Free online courses & learning. Vocabulary.com i​s a tool that is used to improve vocabulary by using an adaptive learning system that offers differentiated vocabulary instruction to students at all levels. Teachers can use vocabulary lists that have already been created or easily create their own. Vocabulary.com has gamified vocabulary instruction as well. An online tool for properly citing sources.